Temminck, C. J. & Schlegel, H. 1843. Pisces. In: Fauna Japonica, sive descriptio animalium quae in itinere per Japoniam suscepto annis 1823-30 collegit, notis observationibus et adumbrationibus illustravit P. F. de Siebold. Parts 2-4: 21-72. Ogilby, J. D. 1896. 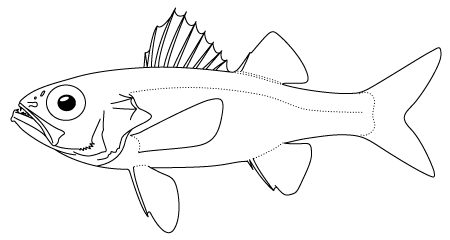 On a new genus and species of fishes from Maroubra Bay. Proc. Linn. Soc. N. S. W. v. 21 (pt 1). 23-25. Steindachner, F. & Döderlein, L. 1883. Beiträge zur Kenntniss der Fische Japan's. (I.). Denkschr. Akad. Wiss. Wien v. 47 (1. abth. ): 211-242, Pls. 1-7. Günther, A. 1887. Report on the deep-sea fishes collected by H. M. S. Challenger during the years 1873-76. Rep. Sci. Res. Voy. H.M.S. Challenger v. 22 (pt 57): i-lxv + 1-268, Pls. 1-66. Poey, F. 1858-61. Memorias sobra la historia natural de la Isla de Cuba, acompanadas de sumarios Latinos y extractos en Francés. Tomo 2. La Habana. Mem. Hist. Nat. Cuba v. 2: 1-96 (1858), 97-336 (1860), 337-442, (1861), Pls. 1-19.